Over coffee today, I got introduced to the new BlackBerry Mini Keyboard, a new accessory for the BlackBerry PlayBook tablet….being a gadget chick who collects gadgets but often have no time to explore them I was cynical. After all I have the top of the range Apple ipod, ipad 1 for work and ipad 2 for personal use, iphone 4S and I use MacBook Air for work plus another funky Apple for home. I’m now on my 3rd BlackBerry so for me to say I’m sold on the BlackBerry PlayBook is something. And the fact that it comes now with a funky keyboard is awesome. The keyboard is ultra portable and comes complete with a stylish convertible case that doubles as a stand for the tablet. In addition to a full QWERTY keyboard, it offers an integrated touchpad that allows users to navigate and control the BlackBerry PlayBook as easily as using the touch screen on the tablet itself…another cool feature. You can also integrate all your emails and documents on the play Playbook, which is also super easy to work on with the keyboard. The keyboard makes it easy to surf the web or use other apps – such as Twitter, Facebook, WordPress and BBM, along with heaps of other funky apps which can be downloaded through BlackBerry App World. The Playbook can also connect wirelessly via Bluetooth to other BlackBerry gadgets, for example, you can bridge your Blackberry smartphone with the playbook, which can then double as a mouse for the Playbook using the track-pad which I think is awesome! Being technologically challenged despite owning the latest of whatever gets launched in UAE, I am now motivated to find out more and get all my gadgets synchronised. 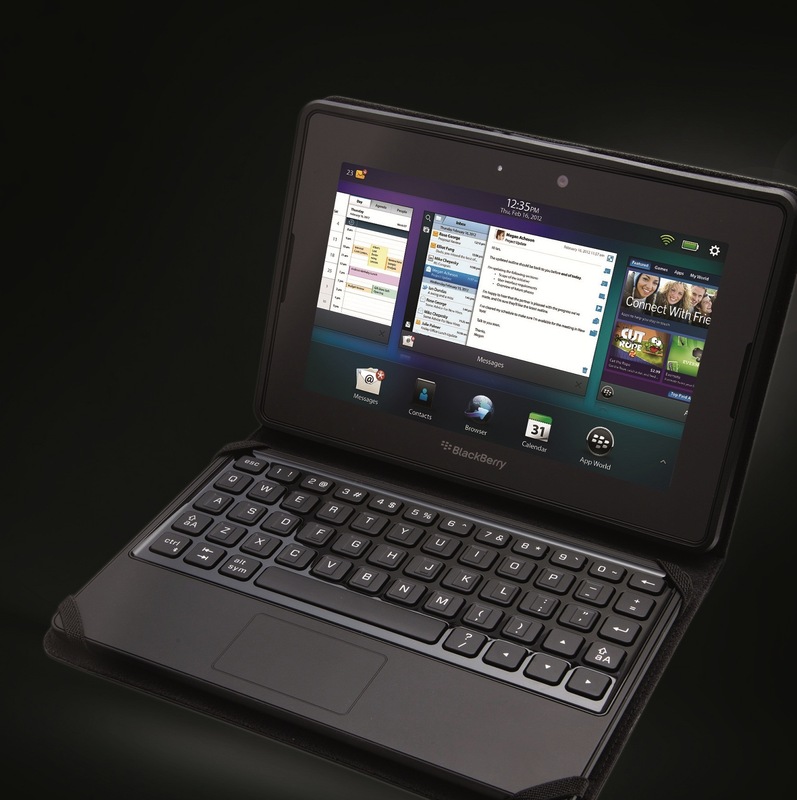 The BlackBerry Mini Keyboard comes equipped with a touchpad that supports BlackBerry PlayBook gestures. The touchpad also offers additional gestures similar to the standard mouse and touchpad controls on a laptop, including a single tap to simulate a mouse click, a two finger tap to right-click, and a two-finger up or down swipe to scroll vertically. Its ultra-portable and lightweight, measuring less than 6mm thick and connects to BlackBerry PlayBook tablet via Bluetooth® with128-bit encryption to keep the data passed between keyboard and tablet secure. Whats also cool is that the keyboard conveniently uses the micro-USB charger that comes with the BlackBerry PlayBook (one less charger to carry), and the keyboard battery lasts up to 30 days on a full charge. I’m sold!